We’d love your help. 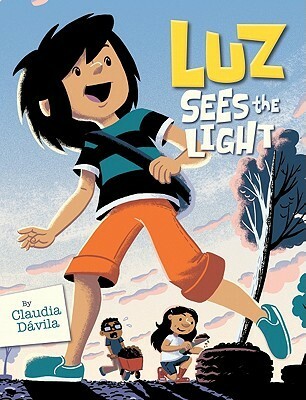 Let us know what’s wrong with this preview of Luz Sees the Light by Claudia Davila. To ask other readers questions about Luz Sees the Light, please sign up. This is a graphic novel intended, I think, for "young readers". It was on a list of great feminist books for young readers and I read it because I've no idea what is appropriate for "young readers" (or how old one must be to fit in that category) and curious about what "feminist" means. Luz lives in a kind of dystopian Sesame Street where gas prices are completely out of control, there are blackouts all the time, food prices are crazy but it is relatively safe to hang out on the street during the This is a graphic novel intended, I think, for "young readers". It was on a list of great feminist books for young readers and I read it because I've no idea what is appropriate for "young readers" (or how old one must be to fit in that category) and curious about what "feminist" means. Luz lives in a kind of dystopian Sesame Street where gas prices are completely out of control, there are blackouts all the time, food prices are crazy but it is relatively safe to hang out on the street during the blackouts. Luz is blissfully ignorant of all this, demanding rides to the mall for designer shoe shopping trips, but eventually "sees the light" and makes a difference in her community through good works. What I did like: The illustrations are fun. The muted mono-color with sharp black and white lines color scheme lends itself to a story that takes place during blackouts and Luz is a natural consumerist and reluctant environmentalist. What I didn't like: It's VERY DIDACTIC and does not disguise it's messages about energy consumption, sustainability and other environmental concerns. That said, when I was young I had this fact-based coloring book on the environment and I loved it. I loved filling in What I did like: The illustrations are fun. The muted mono-color with sharp black and white lines color scheme lends itself to a story that takes place during blackouts and Luz is a natural consumerist and reluctant environmentalist. That said, when I was young I had this fact-based coloring book on the environment and I loved it. I loved filling in all the gallons of water it took to take a single shower and because the memory of this is still so vivid for me, I assume it has informed my current environmental perspective. A tale of learning about the importance of conservation and community in an accessible graphic novel format. I really, really hate children's stories with social and/or political agendas. It's not that I always disagree with the message they're trying to spread, but I have yet to come across one that doesn't use a tone that's corny, lecturing, and unpleasant to read. Remember how 80s and 90s cartoon shows often had PSAs at the end of each episode? This entire story read like an epically long and whiny one from captain planet. The plot was completely secondary to the book's pro-environment message, and m I really, really hate children's stories with social and/or political agendas. It's not that I always disagree with the message they're trying to spread, but I have yet to come across one that doesn't use a tone that's corny, lecturing, and unpleasant to read. Remember how 80s and 90s cartoon shows often had PSAs at the end of each episode? This entire story read like an epically long and whiny one from captain planet. The plot was completely secondary to the book's pro-environment message, and much of the dialogue consisted of having one character recite a monologue about materialism, or eating local, or saving gas, while another character listened and said things like, "Oh!" and "I see!" Also, can I just say that I don't understand how Luz was able to turn an empty lot into a community garden without anyone in her family knowing what she was doing? Isn't this girl like, eleven? Doesn't anyone wonder where she is all day long? Also, did mom and grandma just stop going out of the house for weeks? I have a hard time believing that no one was driving by that empty lot, or that none of the neighbors clued them in to what was going on. When I think about this book, I find myself trying to decide if it's too didactic. And honestly, I kind of feel like if I have to ask that question, it probably is. But when I think about what I read as a kid, I realize that I read a lot of didactic literature. And I enjoyed it. I liked reading "message" stuff in the comic medium WAY better than reading narrative nonfiction. Comics was how I consumed lots of information. So I'm not sure this book deserves to die just because it has an agenda. Fo When I think about this book, I find myself trying to decide if it's too didactic. But when I think about what I read as a kid, I realize that I read a lot of didactic literature. And I enjoyed it. I liked reading "message" stuff in the comic medium WAY better than reading narrative nonfiction. Comics was how I consumed lots of information. So I'm not sure this book deserves to die just because it has an agenda. For kids curious about the effects of global warming, this would probably be awesome. 1. Luz. She's not white! AND does not conform to gender stereotypes! 2. Silly subplots involving computers and rabbits and young love. 3. The slightly future time period. Blackouts are "getting more frequent." Gas prices are around $7 a gallon. Yay for casually incorporating speculative elements into J comics! 1. Colors. At first, I enjoyed the brown and black coloring in depicting the blackout. But once we got back to a powered world, I wanted things to change. A green accent color would have been awesome at the end, for example. I've never seen the word "didactic" used so many times in reviews. Usually I don't add my thoughts or reviews of a book here on GoodReads, but so many people are negative about this book and it makes me sad. Honestly, maybe this book does get preachy and it does have a motive to send a message to kids, but isn't the message being sent an important one? I say bravo to Luz and Claudia Davila! I'm an adult so I would be curious what kids think of this book, but I think there is a nice mix of talkin I've never seen the word "didactic" used so many times in reviews. Usually I don't add my thoughts or reviews of a book here on GoodReads, but so many people are negative about this book and it makes me sad. Honestly, maybe this book does get preachy and it does have a motive to send a message to kids, but isn't the message being sent an important one? I say bravo to Luz and Claudia Davila! I'm an adult so I would be curious what kids think of this book, but I think there is a nice mix of talking about the environment while telling Luz's story about what she learns about how she lives her life, to her relationship with her friends (new and old). Luz Sees the Light is a rather didactic graphic novel aimed at kids eight to twelve that talks about environmentalism and the need to save and conserve energy and gas. Luz lives in a city where gas prices soar and power outages are common, so probably somewhere in California. After some complaining, as any semi-oblivious twelve-year-old would do, Luz thinks about what she can do, and decides to start a community garden in a vacant lot near her house. Her friends think she's crazy and her commun Luz Sees the Light is a rather didactic graphic novel aimed at kids eight to twelve that talks about environmentalism and the need to save and conserve energy and gas. Luz lives in a city where gas prices soar and power outages are common, so probably somewhere in California. After some complaining, as any semi-oblivious twelve-year-old would do, Luz thinks about what she can do, and decides to start a community garden in a vacant lot near her house. Her friends think she's crazy and her community dismisses her, but Luz perseveres and eventually makes a real difference in the world. So Luz Sees the Light is a bit heavy handed in the green message. But I would highly recommend this work for 4th grade and above, and I surely recommend this work for the teachers on the ISD campus running the green garden, composting, and promoting the community garden behind the ISD Library. I love to see the ISD students pushing their wheel barrows back to the compost bin! I think if students saw themselves in this book, they might be even more "into" their own composting and gardening goals. So Luz Sees the Light is a bit heavy handed in the green message. But I would highly recommend this work for 4th grade and above, and I surely recommend this work for the teachers on the ISD campus running the green garden, composting, and promoting the community garden behind the ISD Library. I love to see the ISD students pushing their wheel barrows back to the compost bin! I think if students saw themselves in this book, they might be even more "into" their own composting and gardening goals. This book has some incredible artwork. The story is decent, but the plot is caught between over the top obvious and packing too many ideas together in one. I am not sure it will catch too many children. Nice short read that can get kids interested in the environment with some great characters. Luz is having a grand old time making a brownie, singing, and dancing when.... out goes the light. After some initial confusion her mother explains it's a blackout. This is the beginning of Luz's ultimate journey to improve the community and environment. Throughout the book Luz is getting knowledge from her mom or Gord, the crazy neighbor who is preparing for more blackouts to come, about how everything works. How gas is getting too expensive and why, how food that's imported from other places so it's cheaper to buy locally, and not driving in your car to get a couple of blocks from where you're at can mean less pollution. It's all about the environment and community. Luz finds this plot of land that she decides she can do something with it. Her friends don't believe in her so she just gives up which is the one thing that bothered me about the book. She says she tried but all she did was talk until her friends came around. That's not really taking initiative. So I had no idea what this book was about when I requested it. At least I don't remember. All I know is I loved the cover and the play on words with the title. Luz=Light for people who don't know. It's in comic book format which I thought was a great idea. This book is very positive and very instructional so I don't think your average kid will be entertained by it but I know younger kid's maybe 2nd or Third grade will love this book. I mean who wouldn't want a comic book when they are that little? It'll benefit them. As for me I thought it was interesting that Dávila came up with this idea. I thought it was cute basically and fairly entertaining for myself. Now to introduce Luz's friends. Robert is the new kid in town who brings with him a bunch of computers, loves designing t-shirts, and seriously freaks out whenever anyone talks about blackouts. Video games are pretty key in a kid's life and also mine. I'm surprised Dávila didn't talk about how solar panels can produce energy. It was probably because she was going for the-you-really-have-to-get-out-more-because-it's-fun type of feeling. It's a small community but here where I live. It doesn't work that way but again it's a positive feeling type of book. Like many tweens, Luz is mostly concerned about the comforts of her everyday life - electronics, tasty food, and rides to the mall whenever she needs them. It doesn’t occur to her that wasting electricity, gas, and other resources actually leads to problems until her mom starts buying locally grown food and limiting the amount of energy the family uses. Then Luz decides to turn an abandoned lot into a garden so that she and her neighbors can become more self-reliant and less dependent upon impor Like many tweens, Luz is mostly concerned about the comforts of her everyday life - electronics, tasty food, and rides to the mall whenever she needs them. It doesn’t occur to her that wasting electricity, gas, and other resources actually leads to problems until her mom starts buying locally grown food and limiting the amount of energy the family uses. Then Luz decides to turn an abandoned lot into a garden so that she and her neighbors can become more self-reliant and less dependent upon imports and chain stores. Though I appreciate the story’s message, I couldn’t quite connect with Luz as a character. The environmentalist theme seemed to take over every aspect of the story in a way that felt forced, and because of this, Luz’s conversion from selfish and materialistic to earth-conscious and giving didn’t come across as authentic. At every moment, I felt the story trying to educate me, so I could never just settle in and enjoy myself. I also thought the community garden concept was a bit cliched, considering it has been done a few times before in such books as Seedfolks by Paul Fleischman and Grow by Juanita Havill, and series like Amy Hodgepodge and the Boxcar Children. The truly appealing aspect of the book is the graphic novel format. I think the art is similar in some ways to that of Raina Telgemier or Jimmy Gownley. The figures are cartoonish and endearing, and their faces go a long way toward demonstrating personality traits the flat dialogue doesn’t really include. I’m not sure there is any particular advantage to telling this specific story in graphic format, but at least it makes the book stand out somewhat from others on the same subject. Luz doesn't think much about sustainability or green living. She always wants her mom to drive her to the mall (when she could just as easily walk) and she's dying to buy a pair of designer shoes that are imported from Europe. But then blackouts keep plaguing the city, which inspires Luz to find out about how energy use impacts the planet. Her mom explains that relying on too much energy (i.e. oil and coal) depletes the Earth of its natural resources, and that if we're going to make them last, w Luz doesn't think much about sustainability or green living. She always wants her mom to drive her to the mall (when she could just as easily walk) and she's dying to buy a pair of designer shoes that are imported from Europe. But then blackouts keep plaguing the city, which inspires Luz to find out about how energy use impacts the planet. Her mom explains that relying on too much energy (i.e. oil and coal) depletes the Earth of its natural resources, and that if we're going to make them last, we need to adjust our lifestyles by doing things like buying locally and walking/biking to destinations that are close by. Luz is inspired, and decides to transform a trashed vacant lot into a community space/garden. At first she's overwhelmed with how much work it will be, but then her friends and neighbors pitch in to make her dream a reality. It won't save the world, but the community garden is a small step in the right direction for Luz's city. I've always had a book-fetish about communities coming together in disaster. After reading the incredible A Paradise Built in Hell: The Extraordinary Communities That Arise in Disaster, I started seeing this pattern everywhere. This is the elementary/middle grade graphic novel version. It's a given in this near-future that Bad Stuff Is Happening: blackouts are common and gas is too expensive for Luz's family to buy. Luz is grumpy at first about not being able to go to the mall when she wants, bu I've always had a book-fetish about communities coming together in disaster. After reading the incredible A Paradise Built in Hell: The Extraordinary Communities That Arise in Disaster, I started seeing this pattern everywhere. This is the elementary/middle grade graphic novel version. "proof that we're not alone, and we can all work together and help each other to learn stuff and grow stuff and make stuff and build stuff... So that in the end, whatever happens, we can rely on ourselves for the things we really need!" This book was pretty much written for me, huh? Climate change, melting ice caps, water shortages, nonrenewable energy sources, ozone holes, big agriculture businesses: there's a plethora of environmental concerns that we face that can be frightening and overwhelming for kids. Luz Sees the Light approaches the ways environmental concerns impact our lifestyles in and makes it a little less big and scary. Yes, it is didactic. But why is that a bad thing? We should be learning where our food and energy comes from. We should be conscious consumers Climate change, melting ice caps, water shortages, nonrenewable energy sources, ozone holes, big agriculture businesses: there's a plethora of environmental concerns that we face that can be frightening and overwhelming for kids. Luz Sees the Light approaches the ways environmental concerns impact our lifestyles in and makes it a little less big and scary. Yes, it is didactic. But why is that a bad thing? We should be learning where our food and energy comes from. We should be conscious consumers, and understand how our actions can impact a larger communities. Helping the environment doesn't have to be overwhelming or panic inducing, and books like this can help break that down for young people. The many characters in the book present a variety of outlooks on and approaches to environmental change, from reluctant worry, to practical planning, to apocalyptic panic. This graphic novel follows young Luz as she begins feeling the effects of power shortages and rising gas prices. Frustrated by the complications these have thrown into her life, she seeks out ways to simplify her life and enjoy herself. She is then inspired to try to create a community garden. There are some elements of the story that touch on safety concerns and the way prices can rise on items due to gas prices. Though the character appears to be Latina, and her neighborhood is mostly made up This graphic novel follows young Luz as she begins feeling the effects of power shortages and rising gas prices. Frustrated by the complications these have thrown into her life, she seeks out ways to simplify her life and enjoy herself. She is then inspired to try to create a community garden. There are some elements of the story that touch on safety concerns and the way prices can rise on items due to gas prices. I really enjoyed this tan, black, and white graphic story. It DOES have a very strong message about the environment, and oversimplifies the ecological issues a bit, but it's appropriate for the grade 3+ audience to do so. Because of the comic format, concepts about the advantage of "buy local", for example, are easier to visualize. The main character, Luz, is a mall-shopping, sneaker-craving girl who doesn't understand why multiple car trips are a problem for her mom's pocketbook and the environ I really enjoyed this tan, black, and white graphic story. It DOES have a very strong message about the environment, and oversimplifies the ecological issues a bit, but it's appropriate for the grade 3+ audience to do so. Because of the comic format, concepts about the advantage of "buy local", for example, are easier to visualize. The main character, Luz, is a mall-shopping, sneaker-craving girl who doesn't understand why multiple car trips are a problem for her mom's pocketbook and the environment. Slowly she comes to understand the issue AND finds a way to have a positive impact on her own neighborhood. Did other readers note that, even though this book criticizes importing consumer goods, this book was printed in China? Luz loves electricity and it isn't until there is a powere outage that she literally sees the light. A power outage makes it less fun to do things but when Luz discovers all the cool things that can be done she really gets an idea of self-sufficent really means. I love how later on in the graphic novel that Luz helps to make something that is being wasted become something beautiful for her community. In later episodes of the graphic novel she learns about planting her own garden. Great for grade Luz loves electricity and it isn't until there is a powere outage that she literally sees the light. A power outage makes it less fun to do things but when Luz discovers all the cool things that can be done she really gets an idea of self-sufficent really means. I love how later on in the graphic novel that Luz helps to make something that is being wasted become something beautiful for her community. In later episodes of the graphic novel she learns about planting her own garden. Great for grades 3rd through 6th. While this is a "message" story, it didn't feel heavy-handed, at least about the social and ecological aspects. A couple of the characters are totally insane, but that's another matter. Luz sees a number of problems with the world, and she certainly can't solve all of them, but what she can do is get together with her friends and clean up an empty lot down the street, so that it can be used by the neighborhood as a park and garden. The story oversimplifies how this would really work, but it's a c While this is a "message" story, it didn't feel heavy-handed, at least about the social and ecological aspects. A couple of the characters are totally insane, but that's another matter.